It’s raining, it’s 2pm, and I’m sheltering in the doorway of fruit machine-heaven, Casino, and I’m wondering whether local Labour MP, (the countdown is running to the election now) Dawn Butler will turn up? On her website, it says she was the first ever black woman to be elected to a British Government. Yes, but will she keep her word to walk round Harlesden with a woman she’s never met before? I decide I’d better put myself in a more obvious position, and stand next to that landmark, the Jubilee clock which is has its own little paved area – often home to the Nation of Islam* or Jesus choirs – in the midst of a triangle of oncoming traffic. I feel somehow vulnerable, even though no-one is taking any notice of me. It is a place for performance. Instead I stare at the its date of completion – 1888 – and wonder at this arts and crafty tribute to Queen Victoria and how it’s found itself in 2010 in the heart of such a wild mixture of peoples. What a paradox, this clock, a delicately crafted acknowledgement of Vic’s successful colonialising, ends up in the middle of Harlesden, a new colony of poverty, often from the old colonised nations. They’ve just geographically shifted. I hear a hearty voice next to me. Ah ha, Dawn has arrived. Has she brought a flunkie? No, Mat, who has come along too and is wielding a camera and carrying a host of Dawn (sorry, local Labour Party) newsletters, is a volunteer helper. This walk, of course, is a pre-election walk. And Dawn is no-shrinking violet. In fact, I was planning to take her to the new housing estates around Church Rd and talk to her about that area. Difficult but changing. But from the offset, it’s obvious that this is a High St walkabout. The electoral boundaries are changing – at the moment, there is a Brent East and a Brent South, they will become Brent Central – are changing at this election, which means Dawn (who is a present, MP for Brent South) is up against local Lib-Dem MP, Sarah Teather (who is at present MP for Brent East). And Dawn does have a fight on her hands, because Sarah is a very popular, committed MP. Not that you would know it today. Dawn doles out a newsletter to the Somalis at an internet shop with unforced jollity. One of the local beggars asks for a pound. I gave the same man some money last week. I gave it because I felt disturbed by him and didn’t know what else to do. He looks as though he’s a crackhead, but I’m not an expert. Dawn vacillates, and then gives him a pound coin. This is where I start to like her. She doesn’t automatically give him money because I’m there, to look good. No, she almost doesn’t give him anything, then she changes her mind. I find that more directness more appealing, than robotic goodwill. “My mindset is that I’d rather give people like that something to eat or drink,” she says. The next moment we’re popping round the back of a fish shop. “There was a resident dispute that I got involved in,” she says, “the resident was complaining about the smelly mess in the passageway.” Lo and behold, it is tidy. Not a hint of a red snapper in sight. Does she eat much fish, I wonder? People in Harlesden eat a lot of fish. “I always eat a lot of sprats at Easter,” she says. 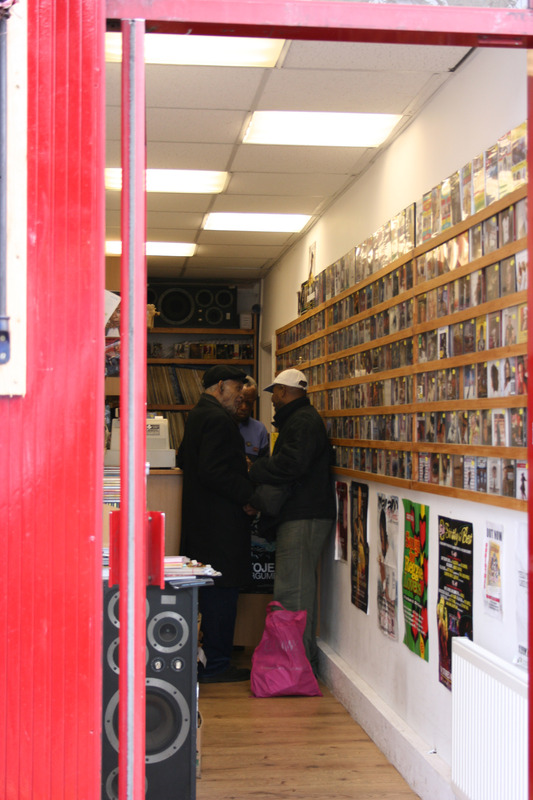 Hawkeye Enterprises – winningly both a record shop and a bakers – is a legend in Harlesden. Dawn knows the bloke who owns it – this is the same person that Charlie(who I met on the first walk at Paddy Power) had recommended that I search out if I wanted to know about dancehall – and calls him ‘Dr’ but he’s not around today. But his mate is. He decides to give a Dawn a hard time. “I asked my niece, 20, and nephew, 18, whether they are going to vote,” he says, “but who are they going to vote for. Politics, it’s a disgrace.” Not that Dawn is one tiny bit daunted. “Get lost,” she declares with a laugh. No, she’s already telling me how fantastic JJ’s winebar is over the road, how they grow their own vegetables out the back and how they help young people out with different projects. That’s something I love about Harlesden. Whilst the rest of London is heavily into brasserie and gastro-pub territory, Harlesden actually thinks it’s being a little adventurous with a winebar. And, in a way, it is. By bucking any trends altogether. A 20something DJ stops to have a word. Does she know any youth projects he can get involved with? She does and tells him to email her. Next, she’s chatting to an elderly Somali gentleman. “We need to campaign in the Somali community because so many people are not registered to vote,” she says. He agrees. Before I know it, she’s whisked us into Lords Shoe shop. Another famed Harlesden retail outlet. Dawn spots a pair of high-heeled, silver, padded boots. “Perfect campaign shoes,” she opines. Another shopper expresses her doubts about their lack of conventionality and the effects on the voters. “In Brent, we don’t do straight,” guffaws Dawn in recognisable Butler style. The shopper sells properties on the recently refurbished Stonebridge estate. How much is a two bedroom flat there now? £200,000. “Not long ago, you couldn’t give them away,” says Dawn. Apparently local resident, Louis Theroux was out on the streets the other day promoting a Brent Council ‘Support Your Local Shops’ campaign by handing out their hessian bags. But I haven’t managed to persuade him to walk with me yet. I will. I will. But here we are in Miracle Fashions, and Dawn has been drawn magnetically towards a orange and green matching pair of shoes and bag in colourful Kente material. Only £45 for both. “Wicked,” she says as she tries them on. Dawn definitely has a shoe thing going on. But being Dawn, she totally unabashed about it. She wants a pair for her mother too. “I won’t get her flowers, I buy her these shoes, she’ll love them. I’m supporting local businesses,” enthuses Ms Butler. The shop owner is delighted. She wants to have her picture taken with Dawn. For the wall. We pop into BASES (Brent Adult &Children’s Education Service) which is being closed down and moved across the road to the new library. The receptionist wants to know what is happening about the number 18 bendy buses. “They’ll soon turn into double deckers,” says Dawn. “I hope they’ll put more on,” says the receptionist. One of Boris’ electioneering pledges was to get rid of the bendy buses. Of course, this is a ridiculous waste of money. Now everyone has got used to the bendy bus. Dawn agrees with me. The new library – it will be officially opened tomorrow by the mayor – is a triumph. I’m not sure it has that many books, but certainly has lots of entertainment. 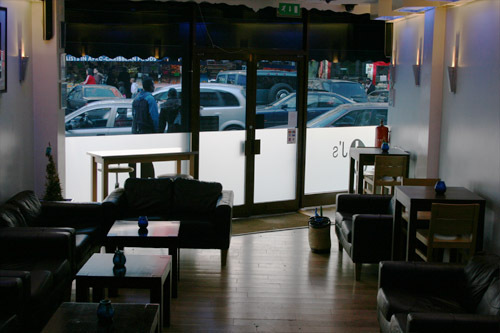 Re-designed, refurbished, modernised – it’s a brilliant new public facility for Harlesden. Big windows, flat screens, light lecture rooms – we have a quick look but I’ll return tomorrow for the grand event itself. Of course, Dawn will be there. The last leg of our High Street tour consists of Dawn popping in on a few old friends. Like Mr Chaudrai who runs Zak’s Shoe Service. “It’s one of the only places in London where you can actually come and get your shoes mended still,” she says. 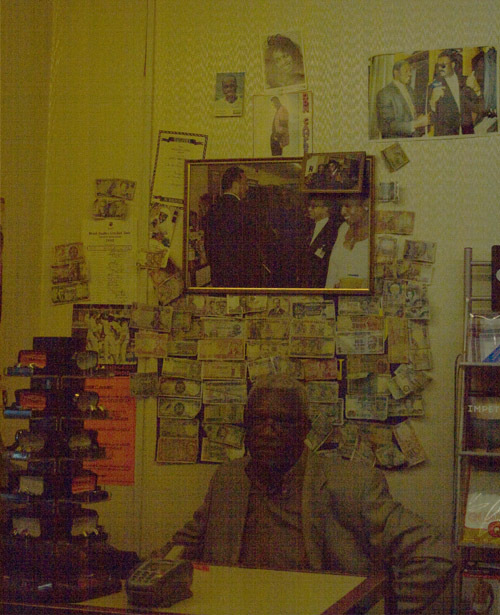 An old Jamaican gent extols the virtues of Harlesden past. “It was so clean when I came in 1960,” he says, “all the shops and streets, you could lie down on them. Look at them now. It was mostly Jamaicans and Irish here back then. 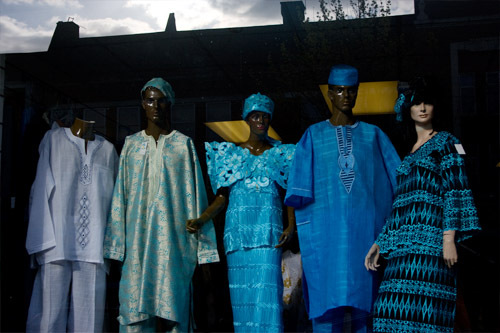 You’d have notices in Willesden newsagents saying ‘No blacks, No Irish and No dogs’”. Next is Aston Insurance where I discover the owner has been there for 26 years. He even went to Capitol City Academy down the road in Willesden when it was a grammar school. 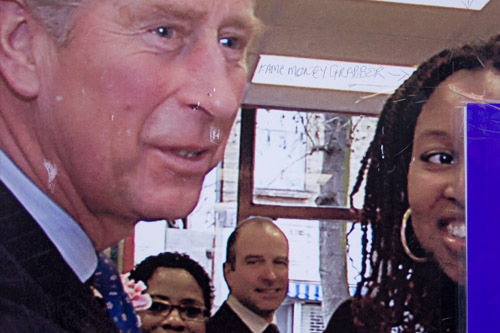 He says Harlesden is a very friendly place. Does he know when M&S left? “1984,” I think, “there was too much stealing going on.” And where was the horsemeat shop? Dawn is horrified. “There was a horsemeat shop here, I didn’t realise we used to eat it,” she says. No, he doesn’t know. Sadly. I don’t know when Jesse Jackson came to Harlesden but he did. Because in the next shop, the misleadingly named AvantGarde – an upscale men’s outfitter’s, trad-cool, I’d call it – the owner, George, a very hip Jamaican man, has a very large photo of himself and Jesse in this very shop. It’s a shock but a good one. Now Dawn wants to be on that wall too. So the photo is taken. Last stop is JJ’s for patties. Dawn treats us. JJ comes out – all beatific face, white hair and possibly the longest locks I’ve ever seen gathered together down his back in what looks like a brown knitted dreadlock bag. They fall down far below his waist. He’s got such an incredible smile, easy, warm, mischievous. Then he shows us round his wine bar. That one, the hidden gem. I’ve never even noticed it before. But it really does look like a good place to have a drink. Posh even, with an aquarium, old posh, rather than zeitgeist posh. What’s happening to plot of land at the back? “It’s been ploughed,” laughs JJ, “ready for new crops.” Meanwhile Dawn is having her photo taken at the bar for JJ. Local MP comes to my wine bar kind of vibe. “I can’t be seen drinking alcohol,” she says being hyper-vigilant re our puritanical culture, “put a bottle of orange juice in front of me.” JJ wants to put on a party to help Dawn with her political campaign. “Let’s get Lascelles,” she says, “he’s just helped me out with events for Alan Johnson and Jack Straw.” Lascelles is a saxophone player. It’s not often I concur with royalty but I have to agree. 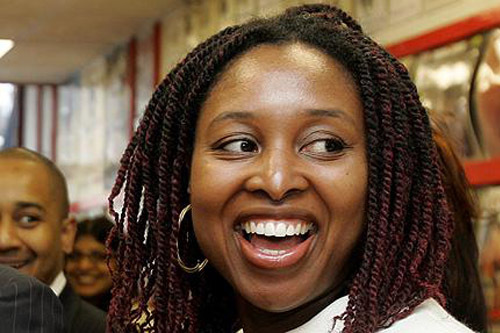 And Dawn Butler has been a revelation. Before I met her, I was going to support Sarah Teather in the election, but now I’m in a quandary. Dawn is a great mixture of laid back, warm, concerned and feisty. I like her. They are both women, which is great. I’m a traditional Labour supporter but this time, I am going to vote for change. But not the Tories. The Lib-Dems need to pay attention to getting more non-white candidates, but Sarah Teather will get my vote because I want national political change – in fact, a hung parliament (we need a new word) could be a good thing, they would have to work together – and she is a very committed local MP. I go down to the new library opening. It’s been re-designed with Big Lottery money – £1.4 million of it. The old building has been modernised in a way that is light, airy and doesn’t destroy the old. Dawn is there chatting to the mayor of Brent. Irish. I’ve forgotten his name. There’s hubbub of local people in the children’s area, at the sugar decoration class upstairs and the creative writing class. Now Dawn is chatting to lithe, tall in vertiginous heels, young woman wearing what I now assume to be a glossy wig. I go and ask the impossibly tall Sabrina what she thinks of Harlesden. “My parents still live here, “ she says, “they won’t move. It’s a vibrant neighbourhood with lots of great people. I love it here. I’m always coming back.” She’s a bit bland but she’s got luscious lips. And then, she says something significant. “I live in Hertfordshire these days,” she explains. I understand – from Harlesden to Hertfordshire – that’s where successful Harlesden girls want to go. Oh dear. I start thinking about the meaning of words as the speeches commence. This is not just a library anymore. 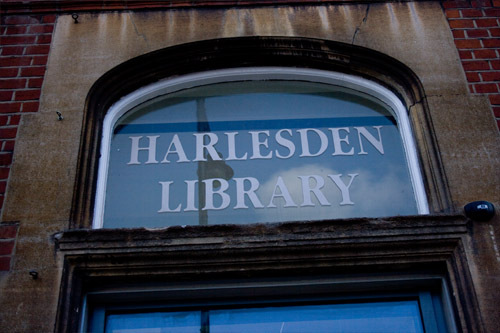 It’s called Harlesden Library Plus, in the same way that it’s the Job Centre Plus down the road. What is it with this PLUS? Does it denote the failing of the idea of ‘enough’ in this age of recession realism when surely materialist maximalism is so over. I know it’s a branding exercise, which denotes more facilities (the One Stop Shop upstairs, adult education, computers, a cheerful children’s area) but it does seem to mean LESS books. The crowd agree. Me too. *Headed by the infamous Louis Farrakhan and inspired by leaders like Malcolm X, the militant Nation of Islam espouses its own kind of Islam in its own black-promoting way.